I visited the famous Fort Worth Stock Show and Rodeo last week. Every year there is an area called "Planet Agriculture" promoting various agricultural products from cotton and corn to milk and beef. 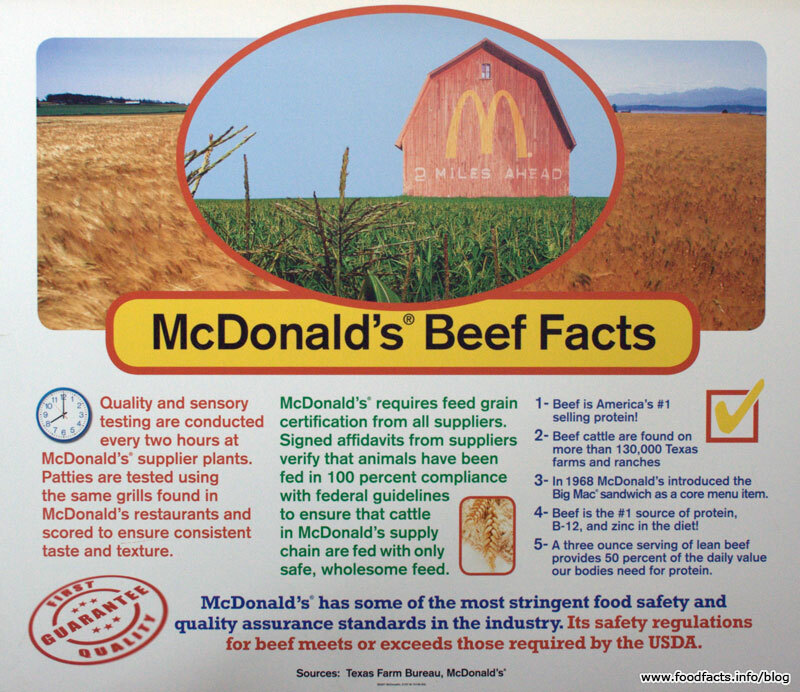 Sponsored by the Texas Farm Bureau, Cattleman's Beef Board (the "Beef: It's What's for Dinner" folks) and McDonald's, the section about beef had lots of information, but I thought I'd share the two signs clearly produced for McDonald's. I've included a transcription of the text below each photo. McDonald's is clearly trying to promote their standard message that their food is healthy, safe and nutritious, but there have an additional marketing target here... the people of Texas. They want Texans to know just how much money they pour into the Texas economy with their copious beef purchases. McDonald's provides nutrition and ingredient information for the majority of our products. Lean Beef (as set by the USDA) is less than 10g of Total Fat, 4.5g or less of Saturated fat and less than 95 mg of cholesterol per serving and 100 grams. There are 29 cuts of beef that meet the government labeling guidelines for Lean. The McDonald's hamburger meets this criteria too! Percent Daily Value (DV) is based on a 2,000-calories diet. Your daily values may be higher or lower, depending on your calorie needs. 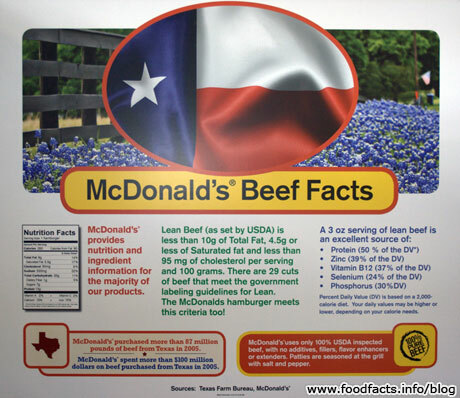 McDonald's purchased more than 87 million pounds of beef from Texas in 2005. McDonald's spent more than $100 million dollars on beef purchased from Texas in 2005. McDonald's uses only 100% USDA inspected beef, with no additives, fillers, flavor enhancers or extenders. Patties are seasoned at the grill with salt and pepper. Quality and sensory testing are conducted every two hours at McDonald's supplier plants. Patties are tested using the same grills found in McDonald's restaurants and scored to ensure consistent taste and texture. McDonald's requires feed grain certification from all suppliers. Signed affidavits from suppliers verify that animals have been fed in 100 percent compliance with federal guidelines to ensure that cattle in McDonald's supply chain are feed with only safe, wholesome feed. McDonald's has some of the most stringent food safety and quality assurance standards in the industry. Its safety regulations for beef meets or exceeds those required by the USDA. Beef is America's #1 selling protein! Beef cattle are found on more than 130,000 Texas farms and ranches. In 1968 McDonald's introduced the Big Mac sandwich as a core menu item. Beef is the #1 source of protein, B-12, and zinc in the diet! A three ounce serving of lean beef provides 50 percent of the daily value our bodies need for protein.